Dash Browser is the PUP that uses misleading techniques to prevent removal. Use Reimage to locate malicious components and get rid of them faster than with uninstall instructions. A full system scan blocks virus reappearance and prevents traffic to malicious domains. What do you need to know about Dash Browser? How to remove Dash Browser ads? If you are a curious computer user, you might be convinced to replace your current web browser with Dash Browser (by Easy Living). Alternatively, this potentially unwanted program (PUP) can sneak into your computer system and make itself a default web browser without your knowledge as well. The only thing you need to know about this adware-type program is that it is not a safe one and that you should stay clear of it. This application pretends to be a Google Chrome browser (as it copies the design of this Internet browser), but the difference is that it also watches and preserves what the computer user does on the Internet, looks through the browsing history, downloads’ list, collects search queries and similar information. Later on, it uses such data to select and display particular content, sponsored by third parties. This adware is very annoying as it sends pop-up ads, opens them in new tabs, or displays them as banners on every website that the computer user visits while browsing via this browser. What is more, this browser promotes Trovi search, which is a highly unreliable web search engine. You can read more about it in this post – What is Trovi and how to get rid of it? Although this browser claims that Dash Browser ads come only from high-quality advertisers, we do not suggest you to count on them. Some of these ads can be related to questionable or even malicious Internet pages, so be very careful! Remember that the main aim of the developers of this adware is to generate income by displaying sponsored content, and each time the user clicks on it, they get paid. Sadly, the developers do not even endorse the content these third-parties promote, so be aware that “ads by Dash Browser” can advertise insecure content as well. If you do not want to receive these ads anymore, or if you simply don’t like this browser, remove Dash Browser by using Reimage or a similar anti-spyware program. As we have stated before, this questionable browser is considered to be a potentially unwanted program; therefore, it spreads like one as well. Just like any other PUP, it mostly travels in software bundles alongside download managers, games, file converters, media players, and similar free applications. You have to be careful when you download new programs from the Internet since the majority of freeware distributes various bonus ad-supported programs alongside them. To avoid installing them, it is recommended to choose Advanced or Custom settings during the installation process and then to opt out all extra components added to the primary program. After that, the installation can be finished without any worries. You should practice this method every single time you download a free app from the Internet. 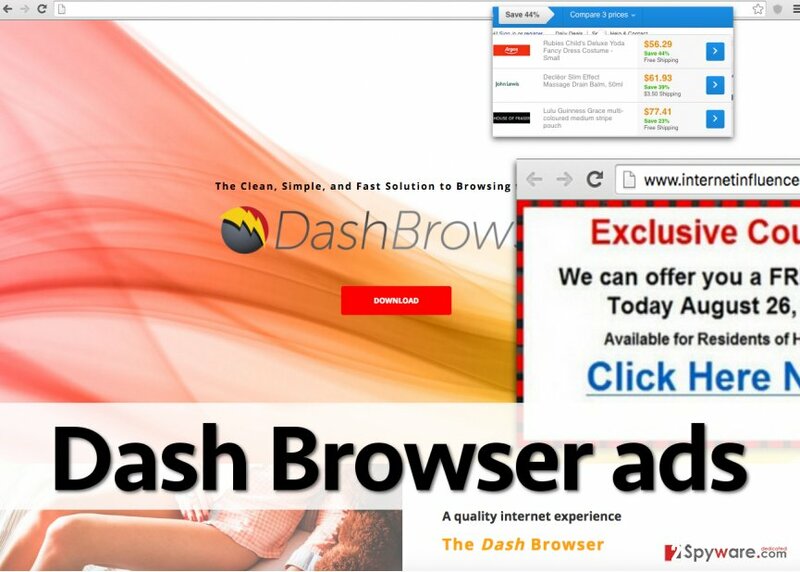 However, if you have already installed Dash Browser adware, you should continue reading below. Potentially unwanted programs are annoying, and some of them can be incredibly stubborn. Unlike typical programs, the majority of them do not have uninstallers, and they are created with an intention to make the computer user go that extra mile in order to uninstall it completely. The program that this article is about is quite hard to remove, too. The users must find every single component of this potentially unwanted application and delete them one after another to entirely eliminate this adware. If you do not know how to identify these components, please follow Dash Browser removal instructions that we have prepared. If for some reason you cannot uninstall this threat manually, try using an automatic spyware removal tool then. We recommend using Reimage software for that. Here, look for Dash Browser or any other recently installed suspicious programs. Wait until you see Applications folder and look for Dash Browser or any other suspicious programs on it. Now right click on every of such entries and select Move to Trash. When in the new window, check Delete personal settings and select Reset again to complete Dash Browser removal. Once these steps are finished, Dash Browser should be removed from your Microsoft Edge browser. Here, select Dash Browser and other questionable plugins. Click Remove to delete these entries. Now you will see Reset Firefox to its default state message with Reset Firefox button. Click this button for several times and complete Dash Browser removal. Here, select Dash Browser and other malicious plugins and select trash icon to delete these entries. Click Reset to confirm this action and complete Dash Browser removal. Here, select Extensions and look for Dash Browser or other suspicious entries. Click on the Uninstall button to get rid each of them. Now you will see a detailed dialog window filled with reset options. All of those options are usually checked, but you can specify which of them you want to reset. Click the Reset button to complete Dash Browser removal process. This entry was posted on 2016-07-19 at 02:38 and is filed under Adware, Viruses. You can quickly scan the QR code with your mobile device and have Dash Browser ads manual removal instructions right in your pocket. How did you remove Dash Browser ads?